This easy Rhubarb Jam comes together in about 45 minutes all in one pot. It’s a little twist on a classic with the addition of freshly grated ginger and orange juice. Delicious on that morning toast! Hey guys! 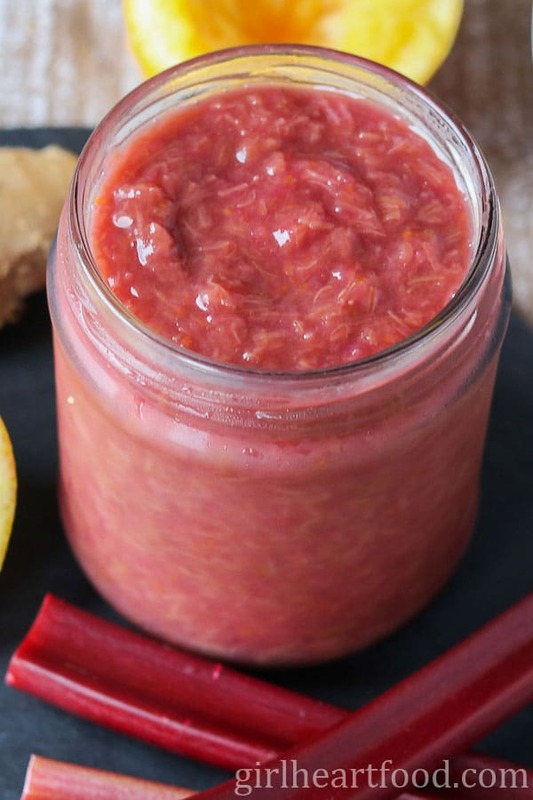 Popping in today with this easy rhubarb jam recipe! Time is running out when it comes to rhubarb availability because the season is so short. I figured I better hurry up while the gettin’ was good because you’re gonna want to make this one. It’s just too darn easy not to! Like pretty much all jams, this rhubarb jam comes together pretty easily. I was watching The Great British Baking Show the other week and one of the contestants was baking something with rhubarb, orange and ginger. I thought what a great idea for jam! Often rhubarb jam is made with strawberries (which is lovely), but not this time! Use a heavy bottomed pot. That’s always my preference when making sauces or jams. Stir every 5 minutes or so, so the mixture doesn’t stick or burn. Don’t like ginger? Feel free to omit it. Like things a little sweeter? Add a touch more sugar. This is a small batch jam recipe, meaning it doesn’t yield bottles and bottles. I didn’t can this recipe here, but if you want to preserve/can it, check out how to here. This jam has no added thickeners and will further thicken as it cools in the fridge. Keep refrigerated and best enjoyed within 5-7 days. Hope you love this homemade rhubarb jam as much as we do! This easy Rhubarb Jam comes together in about 45 minutes all in one pot. It's a little twist on a classic with the addition of freshly grated ginger and orange juice. Delicious on that morning toast! In a heavy bottomed pot on medium low heat add all ingredients. Bring to a low simmer and cook 40-45 minutes until rhubarb has broken down and mixture has thickened. Stir every 5 minutes or so so that it doesn't burn or stick. Pour into a glass jar, let cool slightly and then store in fridge. Mixture will further thicken as it cools. Yields about 2 cups. Enjoy! Use a heavy bottomed pot. That's always my preference when making sauces or jams. Stir every 5 minutes or so, so the mixture doesn't stick or burn. Don't like ginger? Feel free to omit it. This is a small batch jam recipe, meaning it doesn't yield bottles and bottles. I didn't can this recipe here, but if you want to preserve/can it, check out how to here. DO NOT use rhubarb leaves. Use stalks only. The leaves are poisonous. This pectin free jam will further thicken as it cools in the fridge. Lovely. It’s not quite a chutney, but you’re right, definitely not as sweet as a classic jam, which I prefer! Great recipe! I do love rhubarb, but I wasn’t able to make anything with it this season. I bought some twice, and it was sitting in the fridge so long, that it was about to spoil. So both times I ended up cutting and freezing it. Well, maybe its time comes in winter 🙂 Love this jam! You’re right – it works beautifully with orange (I love incorporating a few drops of orange blossom water too), but ginger is something new to me. I need to give it a try! 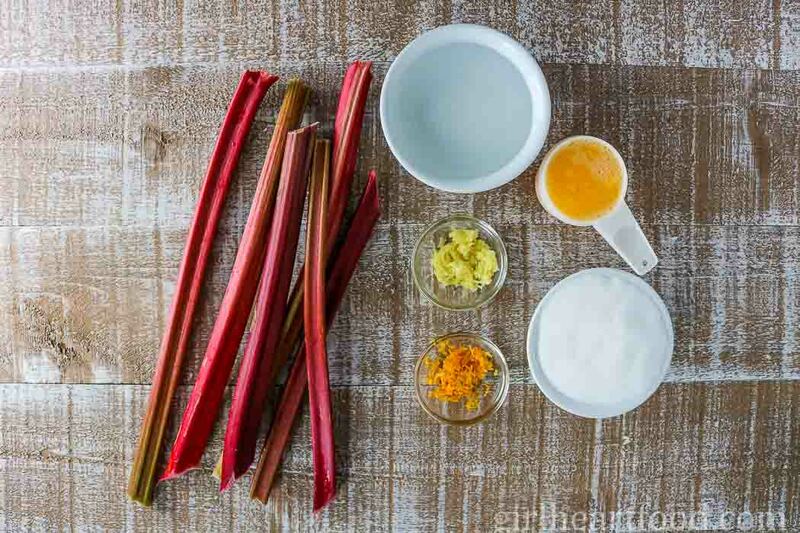 Hope you get a chance to finally make something with rhubarb! Thanks so much, Ben 🙂 The ginger really does add a somethin’ somethin’! My favorite kind of jam – easy and delicious! Rhubarb is my all-time favorite, too! Hopefully it will cool down a bit, and I can get this made! Thanks for the recipe. Pinning! Thanks Laura! Hope you enjoy it 🙂 !! Dawn, I so love this! I tried making rhubarb jam over this summer and it turned out SO BAD! SO BAD! My sugar was way too low and I didn’t think og adding in that zingy orange or specialicious ginger! Gawsh, if I am lucky enough to find rhubarb before the summer ends, I’m so gonna have to give this a try! Thanks for this recipe, my friend! Thanks Thao! Hope you get a chance to try this one out 🙂 Happy weekend, my friend! What a great flavor combo Dawn! And I love the idea of pairing this jam with pork chops! Of course, slathering it on toast would be pretty delicious too! Happy almost weekend! Thank you Leanne! It sure would be 😉 Have a great weekend! Sounds delicious and what a fun way to use rhubarb. I love the addition of ginger. Bet this jam will make a really fun addition to a cheese board with seed crackers. Yum! Pinned. Thank you Milena 🙂 Oh my! That sounds wonderful! Have an awesome weekend! I always look forward to rhubarb season! Jam is one of my favorite ways to use it. I love the addition of ginger, will definitely try this out the next time I make jam! Rhubarb jam is so good, such a lovely flavour. With the added orange and ginger, this sounds just perfect. Delicious on homemade scones. This is such a delicious idea! I always mean to cook and bake with rhubarb more often and then suddenly, summer is over. I can make this once and enjoy it all year long… Well, as long as it lasts anyway! What a great recipe to use up a garden’s bounty of rhubarb! This would be so delicious on so many things but I could eat it right out of the jar. I think I did 😉 Thanks Ellen! Yum! Homemade Jam is the best and this looks like it’s bursting with flavor! I absolutely love homemade jams…almost as much as I love homemade breads. That works out well since they compliment each other, right? 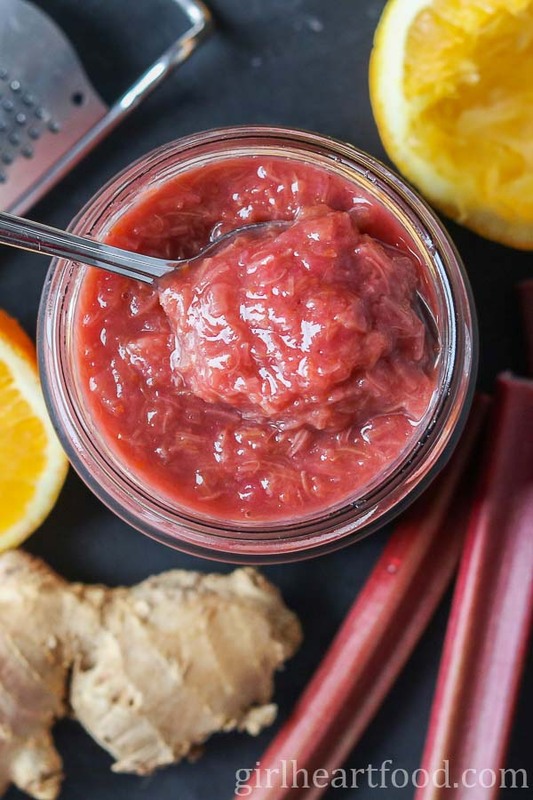 🙂 I’ve never made a rhubarb jam, but I love the addition of citrus and ginger here. This sounds like a delicious way to start the morning! Hope you have a great weekend ahead, my friend! Oh, yes – bread! Nothing like homemade! Thanks David 🙂 You have a great weekend too! My heart skipped a beat when I saw rhubarb in the title of this post. Rhubarb is one of my most favorite foods EVER EVER EVER! I’m thinking paired with orange and ginger it has to be incredible. I just want to eat that whole jar with a spoon! Have a great weekend, girlie! Awww – thanks Kelsie! And lentils, if I remember 😉 Have a great weekend too! I love making homemade jam Dawn. People think it’s so hard, but it’s really so easy! Love the added ginger and orange to your recipe! Bet it’s delicious! Pinned! Happy weekend! Right? So easy! Thanks Mary Ann – appreciate it 🙂 Happy weekend to you too!